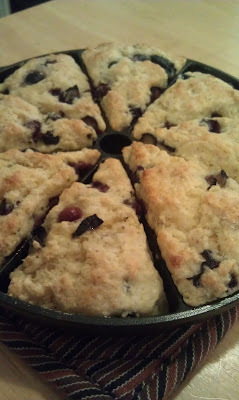 Today, the first day of my vacation, I started off baking Lemon Blueberry Scones. I used the Joy of Baking recipe as a starting point. But I had some plain Greek yogurt I wanted to finish up. And I did not want to make them with a Streusel topping. In a large bowl, whisk together the flour, sugar, baking powder and salt. Cut the butter into small pieces and blend into the flour mixture with a pastry blender. The mixture should look like coarse crumbs. Gently fold in the blueberries and lemon zest. In a small bowl mix yogurt, beaten egg and vanilla. Add this mixture to the flour mixture and stir just until the dough comes together. Do not over mix the dough or the scones will be tough. Bake the scones until nicely browned, about 25- 30 minutes or until a toothpick inserted in the center of a scone comes out clean. Transfer to a wire rack to cool slightly. I went to Whole Pay Check, oh sorry, Whole Foods, and picked up a piece of skirt steak that the butcher cut for me while I waited! Very cool. When I got home I Googled Skirt Steak and found this recipe on Epicurious.com. What an amazing marinate. I did not add the shallots, garlic or cilantro (just not a fan of cilantro). The side dish was easy. Summer Tortellini Salad from 365 Great Barbecue & Grilling Recipes. I think I got my copy of this back in '93. It is the one cookbook I pull out every summer. If I find a recipe in a magazine or newspaper that is a summer recipe it gets tucked into this little paperback. Creamy Vinaigrette ( recipe follows) or salad dressing of choice. Cook tortellini according to package direction until just tender. Drain in colander and rinse under cold running water; drain well. Drop green beans into a large pot of rapidly boiling water. When water returns to a full boil, cook for 2 to 3 minutes or until beans are crisp-tender. Drain and rinse under cold running water; drain well. Gently toss tortellini with beans, tomatoes and just enough Creamy Vinaigrette to moisten, about 1/2 cup. In a jar with a lid, mix vinegar, lemon juice, yogurt, mustard, garlic, sugar, salt, pepper, and hot sauce. Add olive oil and vegetable oil, cover tightly and shade until blended. After use store any remaining vinaigrette in refrigerator for up to 5 days. You must feel like I do, your on vacation and this is a treat to cook whatever you want.. it's like therapy. Love the scones enjoy your time off!